Looking for a good price on the best action camera? We've found the cheapest GoPro deals so you can film your adventures. When it comes to action cameras, the GoPro Hero series is still very much the top dog. These pocket-sized waterproof cameras are fantastic for shooting both high-quality stills and 4K video. They're able to take a pounding and survive freezing temperatures, and thanks to a broad range of accessories, can be mounted and configured in all sorts of ways. The series has gone from strength to strength, and fairly recently found new space for innovation in the form of the GoPro Hero7, which introduced super-stabilised video to the GoPro space. Everyone wants a piece of GoPro kit right now, and there are loads of fantastic deals out there from different retailers. If you want to pick out a bargain, it's well worth shopping around for the best deals on GoPro cameras, and that's where we come in. GoPro cameras have quickly become the go-to tool for filming POV (point-of-view) videos thanks to their low cost, fantastic footage, extreme durability and portable nature. Perfect for strapping to your helmet or chest, they're especially good for intense action event filming, providing a first-person viewpoint of muddy forest mountain-bike descents, extreme snowboarding, sky diving, near-miss wingsuit flying – the lot. If you've seen an extreme sports close call on YouTube, it was probably shot on a GoPro camera. They're not just portable and tough, though. GoPro cameras are capable of shooting with multiple field-of-view (FOV) options. With the GoPro Hero7 Black, you can shoot in 4K at 60fps or in Full HD 1080p at an incredibly slick 240fps, for super-slow-motion creative effects. GoPros also take great stills, and often have a burst mode to give you even more shooting flexibility. We've run through the filming capabilities on each model below, so you can find the cheapest GoPro for your needs. 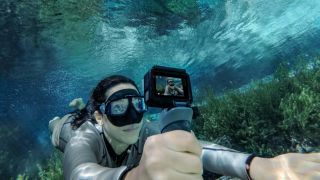 Here are the best GoPro cameras for filming you can buy – and the best GoPro deals available right now for each model. The newest GoPro Hero 7 Black has a similar design and specification to last year's excellent Hero 6, with a custom-designed GP1 processor that captures the same 4K video at 60 frames per second and 12MP wide-angle stills, and it can shoot 1080p at a massive 240fps, for super-smooth 8x slow mo. 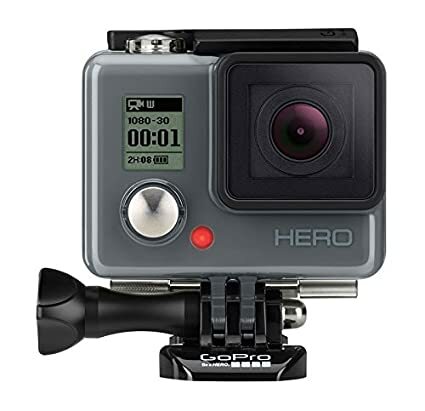 This newer model has added features that make a serious difference to the overall experience of using a GoPro camera. This starts with the new HyperSmooth video stabilisation feature that just about eliminates shaky video. An upgrade over the Hero 6 sees this feature now usable on 60fps 4K video too. There's now a time-lapse feature too and greater audio dynamic range. The UI has also had a drastic overhaul, with swipes and better voice command support making it easier to operate on the move. In short the best GoPro camera just got even better, and launching at a lower price than the Hero6's launch price, it's a no brainer if you want the most powerful GoPro there is. The GoPro Hero 7 Silver is a new mid-range tier in the GoPro lineup, coming in at a more affordable £279.99 / $299.99 price than the Hero7 Black, shaving a few aspects from the specification. It only does 4K video at 30fps, but retains 60fps recording at 1440p and 1080p, which most action camera seekers will probably find acceptable for great quality video at a much more affordable price. The stills sensor is down to 10MP and it lacks the new HyperSmooth video stabilisation feature of the Hero7 Black, relying on the older generation's standard stabilisation features, but adopting the newer models swipe-based interface. But at this pricing it's a more palatable option, and one that will likely carry GoPro to the mainstream. The GoPro Hero6 Black finally introduced 4K video recording at 60fps to the GoPro lineup and with it, a big improvement in video quality. The newer Hero7 model retains these specifications, with the same 12MP still images, and although that model has an improved user interface and video stabilisation feature, you'll get the same high quality video quality from the Hero6. That means there are some great deals to be found on the older model, and it remains a solid deal. The new Hero7 White offers a 10MP still camera and solid 60fps 1080p video, omitting higher resolutions, but dropping the price to £179.99 / $199.99, which means you get an up-to-date GoPro model at a price that makes it an easy choice. It retains all the basic hardware features of the pricier models, such as image stabilisation (although not the advanced HyperSmooth feature that's exclusive to the Hero7) a 2in LCD and voice control. The good thing about new and improved models, is the older versions usually see a price cut – and that's exactly what's happened with the still-excellent GoPro Hero5 Black. This model records fantastic 4K footage, albeit at 30fps instead of 60, but depending on what you're using the camera for this might not matter – especially given the money you’re saving through the better GoPro deals available. Electronic image stabilisation (EIS) isn’t as good as the newer model either, but other than that, the GoPro Hero5 Black has a huge amount going for it. Image quality is superb, with vibrant colours and crisp, sharp detail. Visually, it’s identical to the Hero6 Black, with built-in waterproofing to 10m without a separate case, dual microphones and voice control. There's a reason why the GoPro Hero5 Black received rave reviews when it first launched: this is a fantastic action camera – and the lower price point makes it a very compelling option indeed. Don't be confused by the GoPro Hero 2018. The company released a GoPro Hero years ago – but this is a new version, and it's vastly improved on the original. (If you're worried about accidentally buying the similar-looking older version, just avoid ones with a big round red light on the front – like this one.) The new GoPro Hero is a fantastic budget version of its siblings. Forget about 4K shooting; we're at the cheap GoPro wedge of the market here. But you do get a smooth 60fps performance at 1080p. And like the models above, it's waterproof up to 10m without a separate case. If you're not sure how much you're going to really use a GoPro, this is the cheapest one to get with the added functionality of a touchscreen – something the cheaper GoPro Sessions (see below) don't have – making this is an inexpensive travel companion, and a great entry point into action filming. If 4K video recording is the one thing you can't live without on your new GoPro action camera, then the GoPro Hero 5 Session if your cheapest option. The cube-shaped and water-resistant GoPro has been a big hit since launch, thanks to its super low price and small size, which makes it the most unobtrusive action camera around. The lack of a touchscreen has some users looking towards the more expensive numbered Black models, though. As if the GoPro Hero 5 Session (above) wasn't already incredibly cheap, GoPro released this budget version afterwards. The GoPro Hero Session doesn't give you 4K recording – but you get 1080p at 60fps, which is great value for money. Stills and burst mode take a hit quality-wise, though, if you're wanting to use them much in addition to filming. Unlike the models above, there's no SuperView field-of-view shooting (Wide is still available though) so any 4:3 shooting won't be stretched out to fill widescreens on playback. While it's not the best for shooting footage you'll want to watch over and over again, this GoPro has been very popular for beginners – or as a reliable camera for commuting cyclists and bikers (it attaches nicely to helmets). It's amazing how other road users behave around you when they see you're sporting a camera. Ok, we're getting into the older models now. The GoPro Hero 4 Black – which is actually silver (why, GoPro?) – is still a decent camera capable of shooting 4K at 30fps. But prices can vary wildly. Often, the best GoPro deals on this model will be for refurbished cameras, and not everyone wants to spend so much on a pre-owned action camera. New units are rare (the camera itself is no longer made after all) but you can find a bargain every now and then. We'd urge you to check the prices on some of the newer models in this article though – as there's a good chance you'll be able to get a newer and better model for less money. Happily, the Hero4 Silver is actually silver, like the Hero 4 Black above. (Seriously, what gives, GoPro?) Like the Hero 4 Black though, we'd only recommend picking this one up if you spot a spectacular discount in our comparison chart. Prices are generally more expensive than newer and superior models now, and the 4K capture is limited to just 15 frames per second. So footage will be a bit janky to say the least. The GoPro Karma Drone certainly isn't what we'd call cheap, but it opens up a world of opportunities for some spectacular aerial footage. And it's certainly cheaper than hiring a helicopter, which explains why drones are widely replacing choppers for aerial footage. The GoPro Karma drone comes in two variants: one with and one without a camera. If you can find a discounted price on the Hero 5 Black (or even the Hero 6 Black), it might make more sense to buy the Light version of the drone and the camera separately. We've included comparison charts for both below, but please double-check the listing description and any images on the retailer site to be sure. We'd hate for you to splash the cash and not get a camera too if you were expecting one. Need a recap? Here are today's best GoPro deals on all the best GoPro cameras – in one place so you can compare them more easily.